Modern culture is obsessed with trends. Every day we are all bombarded with new and increasingly ridiculous things that we are told are fashionably 'hip', 'in' and 'hot'. We - the people - get no say in this, it just happens and we are expected to go along with it. Well, no more, we say! Let's leave the past where it belongs and move on! 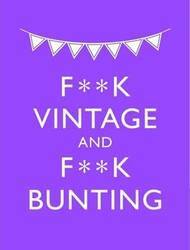 F**k Vintage and F**k Bunting is your alternative antidote to the current national obsession with all things old-fashioned, vintage, old-school and retro. From the countless websites and blog posts that declare 'bunting is in again' to the culture sections of broadsheets telling us that retro is the 'new old school' and totally 'on trend', we say we've had enough! Why can't we all just live in the present? Stuffed full of humorous quotes, facts, stats and trivia to entice you back into the warm embrace of the modern world, this pocket-sized piece of present-day propaganda will help us all put a stop to the madness and tell all things vintage to 'f**k off' back to where they belong - in the past.